HOTROD Autorama, the award is given to the owner of a vehicle that "has exhibited inspired creativity, ingenious engineering and superb workmanship." "As a customer, there were a number of times when Craig would send work our way just because he knew we needed to put food on the table, so to have a vehicle that Craig owned (and then sold to Mike Warn to use as the basis of the project) win this award made it even that much more special for us," says Tim. And for those few who had a problem with the crazy combination of vehicles? "As soon as you turn over the engine and hear that sound, any concern people had would melt away," Tim laughs. New Business Lines, New Friends To win the award, every inch of the car was scrutinized for a full week. Judges agonized over the hundreds of custom- built parts fabricated by the Divers team, including custom fasteners that Divers Speed Shop had invented while building the Ferrambo. The mirror-finished, seven- notched head fasteners also caught the eye of judges for the Ridler Award. So much so, in fact, that Mike Warn encouraged Tim and his team to explore producing the fasteners commercially. Soon after, a new business unit called NotcHead Fasteners was born. 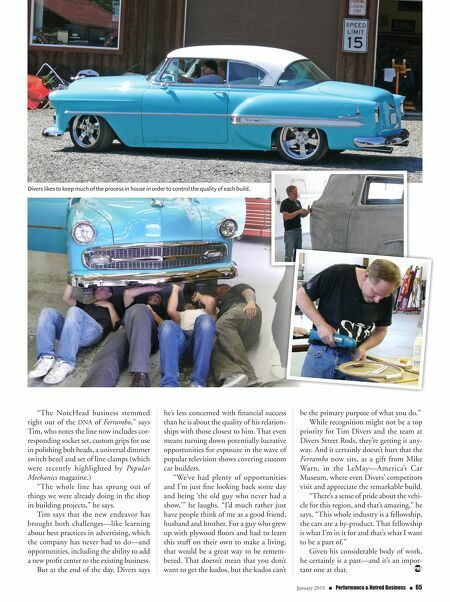 64 n Performance & Hotrod Business n January 2015 The "clean shop" activities include assembly, upholstery and an attached paint shop. "In this business you either have that vision and passion for the work or you don't," says Tim Divers.